The Hilton Hotel Cambridge City Centre was the venue and also the perfect hosts for the official Spectrum launch day! Over 60 guests and corporate supporters joined us for a celebratory lunchtime of the Spectrum launch. We unveiled an insight into our plans and projects to benefit the Cambridge, Ely & Newmarket community that we support. Our passion is inclusion and supporting children with Autism, additional needs and disabilities, alongside their families and carers in the surrounding area. Spectrum Cambridge provides a broad range of events, sessions and days out. These are varied to cover elements of sports, physical interaction, technology, sensory needs and the Arts to stimulate creativity, imagination and bring gains in social development. Complimenting this, we have a number of different support mechanisms for our members to assist those families day to day, support their mental well being. We also very much encourage peer support between families in our community, many of them have travelled similar paths and also felt isolation. Our event structure provides coverage to support activities across children, family units and also adult only respite functions. Our long term goal is to deliver a dedicated building in the surrounding area, this will be a central hub for the families we support. The Spectrum Hub will not only provide a dedicated environment to children with additional needs in our area but also provide opportunities to the local community and companies, in terms of volunteering, gaining work experience and helping us expand into further services. We are truly grateful that our launch has been extremely well received and we can’t thank our hosts and partners enough for this and their involvement to drive it forward. Richard Finn (General Manager) and The Hilton Hotel Cambridge City Centre team have been exceptional in both their time and commitment to Spectrum’s efforts as well as acknowledging our volunteers and the time they give up to make our events and projects happen. It was a pleasure to have this time with the Hilton Hotel Cambridge City Centre team to express our thanks but also to have KD Theatre, Clip n Climb Cambridge, Bottisham Village College, John Lewis, Ultimate British Wrestling and Interactive Theatre International to name but a few, with us on the day. We are truly excited to be working very closely with these companies and organisations moving forwards and value their support immensely. The day was made truly complete when the Hilton team surprised us with a donation of £750 towards our projects which is just truly remarkable. "It is a case of truly exciting times ahead and a pleasure to be involved in the development of Spectrum as it moves forward. With events already planned for the next two years and the opportunity to work alongside some exceptional partners already in place, this is fantastic news for the Cambridge community and the families of children with additional needs living here." 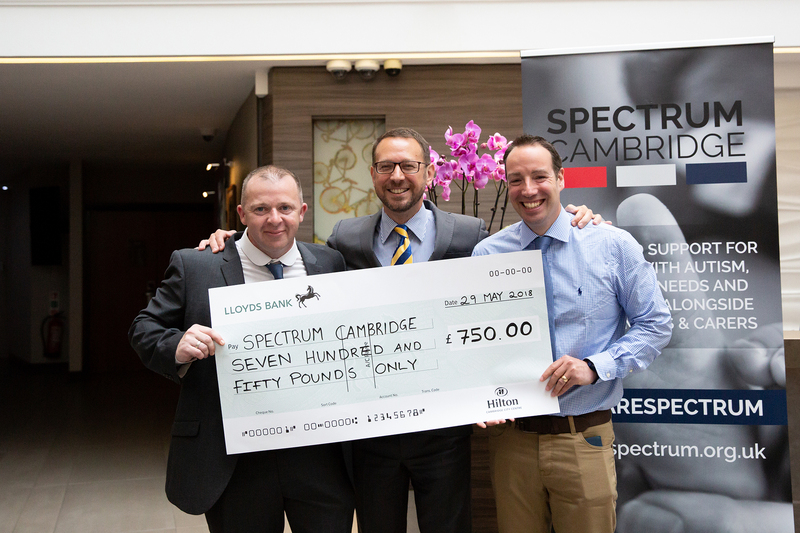 "‘A huge thank you to the Spectrum team and especially Richard Finn and all involved at the Hilton Cambridge. We successfully launched Spectrum Cambridge today at the Hilton Hotel with a number of our members, partners and supporters involved. Knowing we have such an energetic, vibrant and determined team is the best feeling in the world. We are all passionate about offering the best support and care to those children with special needs in the Cambridge area. The future is going to be positive with a lot of fun along the way. The Hilton donating £750 was a fantastic gesture and will go a long way in cementing the foundations for many years to come."